A show called Golden Generation: Modernism in Finnish Architecture and Design will soon be opening at the State Hermitage Museum in Petersburg. This photo, of tiny Linnalankatu in Imatra, South Karelia, will not be featured in the show at the Hermitage. One of the qualities that Finnish modernist architecture has been praised for is its sensitivity to nature and the natural environment in its interactions with the built environment. Many of the masterpieces by, say, Alvar Aalto are praised for just this extreme sensitivity. Oddly enough, one of Aalto’s great masterpieces, the Church of the Three Crosses, is located in Vuoksenniska, Imatra’s northernmost district. 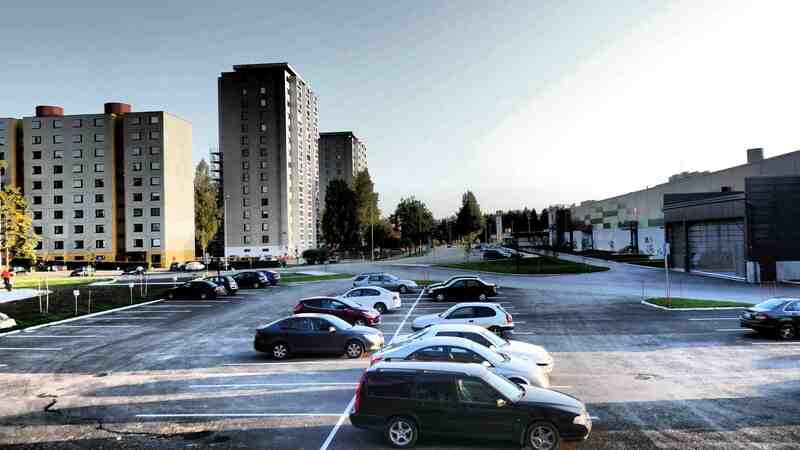 It was built in the 1950s, the same decade that saw Aalto drafting a master development plan for Imatra, which was then only a kauppala (market town), not a full-fledged kaupunkki or city. Aalto’s plan featured a polycentric conception of the burgeoning market town with ambitions of becoming a city, with Imatrankoski (long a tourist center because of its famous rapids), Mansikkala (then mostly an apple in the eyes of city planners), and Vuoksenniska, all of them at a fair but reasonable distance from each other, each serving as an equal but distinct city center around which smaller residential neighborhoods would grow, with certain functions (such as administration and culture, in Mansikkala) focused in one particular center, while other functions, such as commerce, overlapping in all three centers. Aalto counted on Imatra growing into a mighty city with a population of one hundred thousand by the 1980s. As it was, during its heyday in the eighties, the town had something like thirty-two thousand residents, while today that number has shrunk to below twenty-eight thousand. It is hard to know what Aalto would have made of the famous housing estate that dominates Mansikkala, consisting of two types of identical high-rise buildings (there are four of each type), but for this kind of bare-bones modernist housing to work it has to be lushly interlarded with and surrounded by trees, meadows, shrubs, and other kinds of greenery. When you build an estate like this and you’re not Alvar Aalto you cannot afford the luxury of not knocking down trees during construction, as Aalto famously did when building the Church of the Three Crosses. (Infamously, all those beautiful trees Aalto spared were blown down during a terrible storm a couple of years later.) In any case, old photos I have seen of the area back then show that Mansikkala was mostly fields and farmhouses. So it has taken around forty years for the estate to become the lush, homey, quiet piece of semi-paradise its builders and first residents (many of them building co-op members, many of them still alive albeit in their late seventies or eighties) hoped it would be when they planted trees, shrubs, and grass around the comfortable but rather stark new residential buildings in Imatra’s new center, Mansikkala. You are probably wondering right about now where all that lush greenery is in the photograph, above. Well, up until two years ago, the entire foreground and right side of the view you see was occupied precisely by trees, shrubs, and a largish meadow. But it had to give way to a new big box store, the city’s biggest, in a neighborhood that already featured three large supermarkets and a big discount store. The new city planners and fathers, however, seeing the “neighbors from the east” coming over the border in increasing numbers a few years back, decided to throw caution to wind and let the powerful S Group rip up all that greenery and install a Prisma hypermarket in its place. The irony was that S Group already had a Prisma store literally right across the street from where the new colossus to shopping-as-our-only-salvation now stands. To make a long story (whose other parts I will probably tell later) short, the bottom dropped out of the Russian cross-border shopping market, predictably, and now the Prisma hypermarket looks set to destroy its competitors not only in Mansikkala but in the other two central districts of the city as well, because its original purpose, to satisfy ever-increasing numbers of whimsical and wasteful Russians, has disappeared, so it has to have some other purpose, even one it might not have wanted originally. Because what city of twenty-seven thousand people needs the retail capacity of a city of one hundred thousand, as Imatra has now?